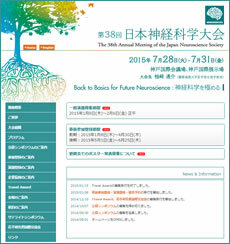 Welcome to the JNS Meeting Planner! With this free online service, you can serch for specific presentations by specifying Session Type, Session Title, Presentation Title, Author Name, and Affliation. You can also browse and exlore sessions by Type or Date. Finally, you can create your own schedule of meeting. Explore sessions by Type or Date. Find specific results on Session Type, Session Title, Presentation Title, Author Name, and Institution. You can also filter your results by day. Create your own schedule of meeting. Please create your account by registering your e-mail address. After logging in using your registered e-mail address, you can select presentations of your interest by clicking the "Add to list" buttons. According to this list, your own itinerary will be created in the "Meeting Planner"tab. Copyright © Neuroscience2015. All Right Reserved.